GOODHOOD has partnered with The Richards Group Re/Max Hallmark to bring you a local real estate series with the hottest market news, the best resources for your home and inside info on buying and selling in Leslieville, Riverside and other neighbourhoods in Toronto’s east end. Toronto’s east side continues to be one of the hottest areas of the GTA, with increasing prices fueled by high demand and lower inventory. Although properties in Toronto’s east end have been on the market for longer than this time last year, they are still selling for more. 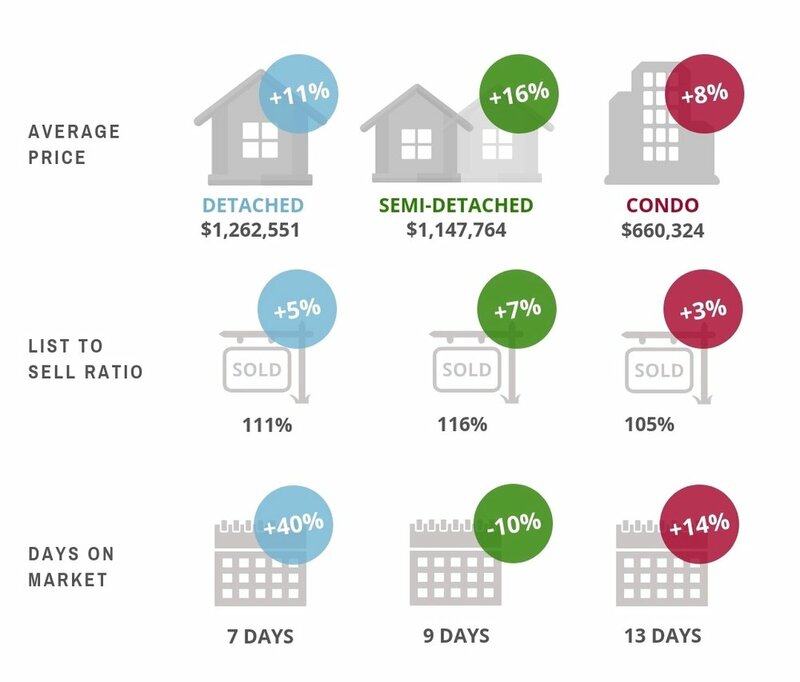 The price of detached homes are up 11% as are condos by 8%, while semi-detached homes had the biggest boost — a 16% increase from last October. Semi-detached homes are becoming a fast favourite for new families; they are selling 10% faster than they did in October 2017, and sold prices just keep climbing with no trajectory of slowing down. In fact, semi-detached homes account for 39% of sales, followed by condos at 28% and detached houses at 17% in the past year. An emerging trend in the east end, and Toronto as a whole, is the investment in mid-rise condos. There has been a decline in investment proposals for the huge tower projects that populate the downtown core as the market continues to call for more family-friendly units in quiet neighbourhoods. Development has gotten underway at the highly anticipated Wonder Condos. The eight-storey space will have 286 units with a mix of lofts and townhomes. Toronto’s housing market showed ongoing signs of stability in October as prices for condos and semi-detached homes jumped, even as total unit sales were little changed. The housing market continues to recover after a slowdown earlier this year in which tougher mortgage qualifications took effect, in addition to a rise in mortgage costs. The beginning of the year had a rough start, as the rule changes made it more difficult to borrow for a home. The 7,492 sales recorded in October 2018 represent a 6% year-over-year increase and a 1% decline when measured month-over-month to September 2018. The increase in demand bumped up price appreciation for this month, with average sale prices for resale homes up 3.5% year-over-year, now reaching $807,340. If you have questions about the market and the neighbourhoods — whether you’re hoping to get into the community or make your next move — get in touch with The Richards Group at info@therichardsgroup.ca or call 416-699-0303 to get the conversation started. Search local listings in Toronto’s east end. The Richards Group Re/Max Hallmark has the honour of being East Toronto’s agency of choice as a result of their ability to help so many clients move their lives forward. They have redefined real estate with an experience of total care, unlocking the true potential of your home while delivering industry leading results, so your next move brings you closer to your wealth and lifestyle goals.